Limor Webber is a mixed media artist and educator. She is a mother of two beautiful little girls that absolutely rule her world and a wife to a supportive husband. Limor is a technique and art medium addict! She can sit in her studio for hours trying to come up with new ideas and techniques that she can share with the world. I met Limor on the Prima Education team and it has been great fun to be around her and her contagious smile and talent! For all you Mixed Media junkies, you know how we all have that one stamp set we keep on reaching for every time we create any project and we say to ourselves,” it’s just not complete without it”. Well that’s how I feel about all three of these stamp sets!! They never get put away, they have a permanent spot on my craft desk since the day I got them. The reason I love them so much as you can see is because they make fabulous background effects but can be used in a subtle way or as a more bold focus point on your project. Do you want to know a little secret that would make your heart sing?! The first day I opened up my sets and I pulled them out…. 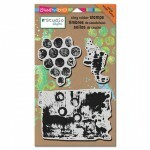 hiding behind the stamps were some fabulous bonus Stencils!!!!!. Needless to say they have become my new favorite staple in my creation! way to go Nathalie!!! you sure rocked these stamps sets out!. Thank you so much Limor for sharing those wonderful projects with us. I love how you used the stamps and templates layered up on the tags creating so much depth. And I am for sure in Love with the Layout of your sweet sweet daughter creating such a wonderful shabby chic design. Please check out Limor’s Blog – she posts a lot of gorgeous tutorials and projects on there and I know you will love it. wow amazing takes on these stamps! Love those tags and yes, Limor does always have them very close at hand. 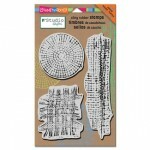 Such depth and texture can be created with these stamps, I can see they’d be used often. Fantastic stamp sets…. They’re on my soon to be fulfilled wish list. Thank you so much Nat!!! you rock! It’s always a pleasure to play with your stamps!! I’ll take a photo of their permanent spot on my desk LoL!!! Those tags are so colorful and full of texture. I’m not sure which stamp set I need first. Mish Mash or Wired as they are both calling out to me. Love the colours and the style of these amazing tags! I do echo Limor’s sentiments about these wonderful stamps….always at my finger tips as well!! Tx Nat! Love Limor and she rocked your stamps and stencils! Her tags are beautiful and full of layers. Thanks for sharing. Nat, liking this new feature- I love watching Limor’s videos- yes,infectious smile indeed! Nice post- love those tags -they are full of deliciousness!